Mice engrafted with a human immune system — HIS or humanized mice — have secured important roles as efficacy models in the immuno-oncology therapeutic development pipeline. Several impressive examples of efficacy studies in humanized mice were on display at the 2017 American Association for Cancer Research (AACR) meeting. Upon engraftment of human peripheral blood mononuclear cells (PBMCs), super-immunodeficient models, like the CIEA NOG mouse®, become premier tools for the investigation of human T-cell mediated efficacy. NOG mice engrafted with human PBMCs (huPBMC-NOG) capture important aspects of the engrafted human immune system for in vivo investigations. The functionality of the engrafted immune system is evidenced by a three-to-six week effective study window (depending on the number of PBMCs engrafted) before huPBMC-NOG mice succumb to graft vs. host disease (GvHD) mediated by the human immune cells. Pieris Pharmaceuticals provided one example of huPBMC-NOGs utility at AACR 2017, where they presented data supporting initiation of clinical development for PRS-343, their T cell-engaging bispecific antibody technology. Pieris's antibody is designed to recruit T cell tumor-killing activities to the site of a tumor by simultaneously engaging the HER2 protein (a tumor-cell target) and T cells. Pieris demonstrated pre-clinical efficacy for their compound using huPBMC-NOG mice carrying HER2-expressing tumors. Administration of the novel therapy dose-responsively inhibited growth of the tumors in huPBMC-NOG mice. 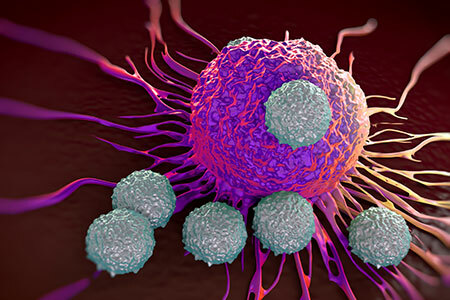 Tumor shrinkage was associated with potent T lymphocyte activation, localized to the micro-environment of the established HER2-positive tumors. Furthermore, GvHD was delayed in huPBMC-NOG mice treated with the bispecific antibody compared to mice treated with a benchmark compound, suggesting Pieris's novel therapy may offer both enhanced safety and efficacy to patients. Human hematopoietic stem cells (HSCs) injected into NOG mice reliably engraft in the bone marrow, where they support and maintain the development of a human immune system throughout the lifetime of the mouse. The human immune system that develops in HSC-engrafted NOG (huNOG) mice is comprised of predominantly human lymphoid cells. Human myeloid cells are also present in huNOG, but develop in low abundance due to the lack of essential human-origin cytokine signals. Similar to huPBMC-NOG mice, huNOG mice are excellent tools for investigating human T cell biology. Because the human immune system matures in the host, GvHD does not occur in huNOG mice, making them much more suitable for long-term efficacy studies. At AACR 2017, several independent research teams presented data leveraging the huNOG mice in long-term combinatorial efficacy studies. Using tumor-engrafted huNOG mice, Mersana Therapeutics and Eleven Biotherapeutics tested distinct antibody-drug conjugates (ADCs) in conjunction with anti-PD-1 therapy, while Roche Pharmaceutical presented data combining T cell-engaging bispecific antibodies in conjunction with anti-PD-1 therapy. All three groups reported data suggesting great potential for combined treatment regimens. Checkpoint inhibition in conjunction with Mersana's ADC compound resulted in a better response than either of the monotherapies in huNOG mice, providing a rationale for single agent clinical testing and for combination with immunomodulatory therapies. Eleven Biotherapeutics' ADC compound displayed enhanced anti-tumoral activity when combined with immune checkpoint inhibitors. Using a mechanism distinct from the ADCs, Roche's T cell-engaging bispecific antibody also resulted in checkpoint inhibitor-potentiated combinatorial efficacy in huNOG mice. HIS models are increasingly important tools in the immuno-oncology therapeutic pipeline. However, advances to HIS models and to their application are needed to enable many types of studies. The human myeloid lineage, which is poorly developed in huNOG mice, is significantly improved in HSC-engrafted NOG-EXL (huNOG-EXL) mice that express human GM-CSF and human IL-3. This illustrates that human-cytokine delivery is one approach for improving HIS model performance. Another limitation of the current generation of humanized mouse models is that human NK cells develop at low frequency in both huNOG and huNOG-EXL mice. In their AACR 2017 poster, Affimed GmbH reported overcoming this limitation by hydrodynamically delivering human IL-15 to huNOG mice, which significantly boosts overall human NK cell numbers. This increased frequency of NK cells allowed Affimed scientists to obtain favorable efficacy data for their NK cell-engaging bispecific antibody. The next generation of NOG mice for human immune system engraftment include NOG-EXL, hIL-15 NOG, hIL-2 NOG, and hIL-6 NOG. While transgenic expression of human GM-CSF and human IL-3 enhances myeloid lineage development in HSC-engrafted NOG-EXL mice, other next-generation models tend to bias their effects to specific immune cell lineages. Both hIL-15 and hIL-2 NOG have been shown to enhance NK cell engraftment and may prove superior to hydrodynamic cytokine delivery models for NK cell-mediated efficacy investigations. The monocyte lineage is enhanced in HSC-engrafted hIL-6 NOG, suggesting it may be a useful model for interrogating monocyte and macrophage roles in cancer.